If there's one thing Amber McGee can't stand, it's a drama queen. So when her best friend Zack asks her to look after Chastity, the spoiled-rotten zombie princess, Amber's less than thrilled. Chastity needs a full-time baby-sitter, and Amber's got no patience for her constant complaints and uppity 'tude. Things go from bad to worse when Chastity follows Amber to school and bumps into local bully Parker Tolan. The zombies are supposed to be kept under wraps, and now Amber's biggest enemy is in on the secret. And- weirder than weird- he's actually developed a crush on the zombie! Can Amber find a way to keep these two crazy lovebirds apart- and get Chastity back to where she belongs? Maybe someday, I won't have a million things going wrong all at once. But today is not that day. That's the thought that was running through my head as I got dressed that morning. I was already late, and my mom was yelling up the stairs at me: "Amber, we're supposed to be at the mall in ten minutes. Are you almost ready?" I wanted to make the woman happy. I really did. I did promise to make a trip to the mall just so she wouldn't feel so bad about having a soccer-playing tomboy for a daughter. But when I looked out the window, I saw a zombie chasing my friend Zack Margolis around. And I had to do something to help him. Here's a totally different, totally hilarious take on zombies. Amber, Zack and Kyle get stuck with a bunch of zombies who are hell bent on driving them insane. Mostly by trying to pretend that they can still lead a normal life...in other words, forgetting that they are 'undead'. There's Lassiter who wants to take over the world, there's Penelope who has a mad love for cooking despite being a total fire hazard; and then there's Chastity who considers herself a 'lady' and tries hard to get Amber to become one, too. Amber and her friends try their best to get the zombies to move on... to, say, 'never-never land'. Like the charming (and much more cooperative) zombie Jeremiah. But things begin to go downhill when the local bully and his sidekick come across Chastity- and develop a crush on her, thinking that she's an actress preparing for her next role as a zombie! The whole episode is rib-tickling; especially finding Parker blush at Chastity's compliments. Then there's the mystery behind Chastity's death that needs to be solved in order to help her move on; the story of her childhood makes a really interesting read. Also, Amber's relationship with her mom and each of their attempts to understand one another better is at times really funny, and at others quite touching. 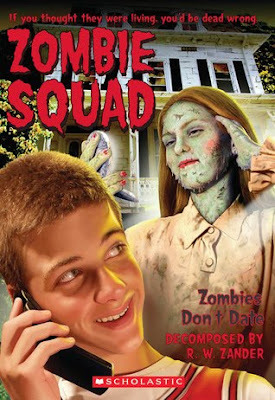 The end of this book in the Zombie Squad series is somewhat filmy, but not exactly predictable. This is just the right book to lay your hands on if you're looking for full on entertainment. The Magic of Recluse - L.E. Modesitt, Jr.